SOUND ‘ROUND: Are we humanz, or are we androidz? 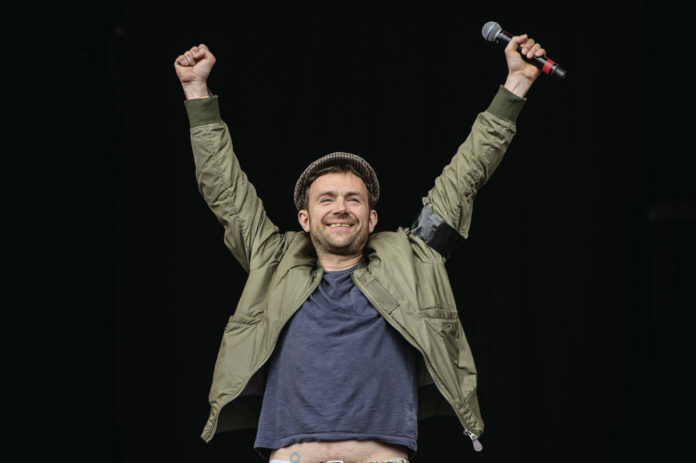 British musician, Damon Albarn performs at the Glastonbury music festival at Worthy Farm, in Somerset, England, Friday, June 24, 2016. There’s a fine line between unbearable misanthropy and macabre satire. It’s a dichotomy Damon Albarn has long juggled with this virtual band. For every depressive dance anthem (“Clint Eastwood”), there’s an equally ebullient banger (“Feel Good Inc.”). The cartoon characters that front this art project are a distancing mechanism that allows Albarn to fetishize his apocalyptic daydreams, a fantasy world made dangerously real by President Trump. These songs were recorded during the U.S. election and made under the assumption of his eventual victory. Looking for hope through the darkness? The best you’ll get is the out-of-place finale “We Got the Power,” a blast of electro-punk in which Savages’ Jehnny Barth promises to never give up hope — how 2008 of her. But if you’re looking for an anti-hate rally cry, no dice either. The warped gospel of “Hallelujah Money” is as close as things come to a formal protest, border walls and crony capitalism included. Much of the rest is nothing new: horrorcore synths, De La Soul cameo, gallows humor that misses the point. There are reasons to believe, however. Vince Staples brings the heat, Popcaan slithers with glee and Mavis Staples starts a revival. Think there are too many guest spots? Get real. They help Albarn keep out of his own damn way. The big to-do surrounding Alejandro Ghersi’s third album proper is the introduction of vocals from the former recluse himself. How much that piques your interest still depends on whether or not you dig a-rhythmic, tuneless electronica that aims to challenge and inform rather than entertain. Me, I’m glad he’s finally stepped out of the cocoon his wealthy Venezuelan parents put him in during a childhood spent homeschooled in a gated community. The fact the lyrics are in Spanish will maintain his status as an unknowable figure to much of his burgeoning American audience — not to mention the digital effects that bend his weepy alto into a putty of sound. For the bilingual, or those in Spanish-speaking households, you get a front row seat to his limbic system. From what I’ve parsed through Google Translate (not an exact science, I know), Ghersi’s lyrical play concerns unrequited love and self-worth, a fitting theme for a gay man who disavows traditional identity politics. “Anoche” (translation, “Last Night”) details a one-sided love that drives him to the point of madness while “Sin Rumbo” (“Aimlessly”) deals with the fallout of dissolved accords. Though his music remains meticulously robotic and deliberately detached, it’s nice to know he just might be a real boy after all.